This design is for darker rough in higher-RI materials, like Rhodolite Garnet or dark Corundum. It is designed to minimize gem depth and maximize reflected light – both from within the gem and from the checkerboard crown – to help recover the usefulness of dark rough. I’m interested in how much you enjoy this design and the video about it. Please leave your comments below – I’ll try to answer every comment or question. Hello John Bailey I would love to take faceting class, well I and my father do deals in gems and know gemstone faceting as well but my cuts are not international standard. though they are eye catching and sparkling but I want flawless and would like to learn meet point faceting as Stephen Kotlowski (Late) and Johd Dyer. Do your academy teach students on Ultra Tech faceting machine ? Thanks for dropping by. The next upcoming class is always detailed HERE. If the information there refers to a date in the past, it means the next event hasn’t been scheduled yet. We typically run a few BASIC courses per year. Those bring new beginners into competence and experienced faceters into higher quality and faster productivity. Intermediate and Advanced trainings are held less often and cover a wide range of specialized or advanced material. In BASIC training, we cover basic meet point faceting and architecture. The program is a BYO (bring your own) faceting instrument, and we teach on any instrument suitable for high-precision meet point faceting. Students are responsible to bring a suitable instrument in good repair and adjustment. We inevitably do some minor adjustments (and teach them) for instruments, but not major trouble-shooting or repairs. For this reason, we recommend bringing a new or factory-adjusted instrument. If you have other questions, please just ask. Meantime, watch THIS LINK for details of our next event! The learning curve is a bit daunting, but the rewards are significant. I personally consider this software a necessary part of the tool-kit of any serious faceter, professional or hobbyist. I think you may have to run a Windows simulator to make it run on a MAC, but I’m pretty sure it’s being done. Google a bit and I think you’ll find out how. Decided to take your course only to discover that I have a commitment w/o May 1. When is youor next class? Hi, Les. Thanks for the comment. Next class is in September. Dates will be set and registration will open very soon. Going to include some more intermediate and advanced training! CAM is for creating explicit non-round girdle shapes. You can use a CAM technique to make an explicit L/W in a rectangle, but it would be more of an exercise than anything else, as you can just do that with a caliper when girdling. So, you don’t need anything as sophisticated – or time-consuming – as CAM to make an Emerald shape. Unable to find a schedule for the training class except for September. It is over. The next class isn’t scheduled. If you are signed up for our newsletter you’ll receive notice through it. You can also e-mail me directly with your faceting ambitions to get on a special “first notice” courtesy list. See you there! I find this very interesting. Could you please let me know where you’re school is located in America. The Faceting Academy is located in Oregon, USA. We have an international student body, with people traveling here from around the globe. Mr. Bailey I have wanted to be involved with gems since I was a boy (many polished rocks) I’m finally at a point in life where I can pursue gem cutting. I have been researching for weeks and happened across your sight while surfing you tube. All I can say is outstanding and very informational. Thanks for the shout. I’m happy to help you pursue your fascination! I was so hoping to be able to secure the funds to get equipment and attend your class in May but thanks to hospital stays and healthcare costs it’s looking doubtful. My question is if I purchase my faceting machine from you will the discount still apply when I am able to attend your classes. Thanks for the great website and information! I too am a COMPLETE newbie. I have only been gem hunting (in plush, it was so fun), but have never even seen a gem being cut, but I desperately want to learn!! I live in Tacoma WA, and was wondering if you have any good contacts over here. I am currently a graphic designer, and i think i would have a knack for it. Let me know if you have any resources for me. Thanks so much!! Welcome to the exciting world of cutting!! We don’t have an extension or affiliate in Tacoma, but we are relatively close. Consider doing the Faceting Academy Resident training program, and you could go back after just 9 days of training ready to cut whatever you like. Shout back with any other questions! Hi my name is Kelly, I am very interested in learning how to facet rough diamonds, and maybe one day advance. I would like to take something rough and make it lovely. I live in Indianapolis, do you know anyone who could teach me? Diamond cutting is different from colored stone cutting. Most diamond cutters do not cut colored stones – and likewise colored stone cutters do not usually do diamonds. Decide which thing you are searching for, and be willing to travel to get quality instruction. Like anything, quality education up front pays for itself in the knocks you get to avoid learning the hard (expensive) lessons on your own. If you should decide to cut colored stones, we are certainly willing to help you get your start. I am very interested in the idea of taking a natural, uncut gemstone and turning it into a beautiful work of art. The skill and precision used is amazing, and i would love to be able to produce a product like that. I am 18 and looking for a potential hobby that could turn into a promising career. I need somewhere to start, and was wondering if you could help find someone in my area where I could get lessons or maybe even work as an apprentice. I am located in south New Jersey. Thank you for your time. I’ll send you some information by e-mail. Thanks for the diagram and I watched the video. Unfortunately I didn’t understand any of it. I have never faceted any stone, I do not even know the basics. The learning curve in faceting is rather steep, and best addressed with hands-on assistance. Given your location, I recommend you contact the Australian Faceters Guild to help you find a potential mentor. My experiences with people in that organization have all been good. They are solid, competent, helpful, and friendly people. Best of luck to you – and welcome to a whole new adventure! How do I become a member, to be able to log in and purchase books, tools etc? You don’t need to log in to purchase books, videos, or tools. Just shop and check-out the way you would on any web site. Membership areas are for people who have purchased membership-based products – like instant video courses, or mentoring programs. You’ll find those things in the catalog – or during the special times when they’re offered. I spent several summers at the dust devil and had a great time. I even operated the equipment. it was a blast. I learned a lot about cutting up there and wish to learn more. You’re in the place to learn more. If you’re subscribed to the alerts, you’ll get e-mail notices of things like the Resident Academy classes and other stuff. This is one of my favorite cuts to see in dark corundom, as a Gemologist working in the trade you get bling blur as i call it. Not with this cut or the trillion. i love em both and look forwards to trying this cut as my first project with my mark iv graves machine.Thanks for the video and the instruction. Hi John . It was wonderful and I enjoyed so much. Thank you so much . Is it possible to download it? The link to download the design is on the page. Hope you cut it soon. I am a novice to this website. Now I understand that I should comment on the Chex Reflex Oval. It looks nice. I would like to cut a rhodolite garnet whith this design. Thanks for the great feedback. Glad you’re getting value from my efforts! Hi John from a very wet UK! Thanks very much for the new designs and specially the video. I have never been too sure what the CAM numbers meant but all is now clear! It is now past midnight here so will save trying it until later today! Great to know we’re helping with the CAM concepts. Check out the other FREE vids on the site about sequencing. There’s one there on OMNI that you may like, too. Let me know whatever else I can share to help out. Am I mistaken? I thought that there were two designs, one square and one oval. How do I find the square design please? Thanks. I managed to omit the second link from the newsletter. I just sent another one out with the second link in it. In case you miss that one, here it is! Please comment on the designs – Let me know what you think – and what you want. I just finished watching your video on the Chex-Reflex Oval video and loved it. I would like to find more of these video’s. They are so helpful. I have already cut a few of the checker board patterns and love them. They look so good and they are not as hard as I first thought they would be. I will look over my rough and look for the darker one that I have put off cutting because of the darkness of them. Was wondering what cut to use on them and now I think I know. Thank you again for all your wonderful information you continue providing us. Looking forward to more instructions. Glad you like this one. Those checkerboards really are easier than they look, aren’t they? If you cut one of my designs and get a good photo, I’ll be happy to feature it on the site! What else would you like to know more about? Hi John, I really appreciate your making so many of your designs available and taking the time to show the cutting sequence in GemCad. Your videos have helped me a lot with using GemCad. Would love to see Videos on what to look for when choosing rough. 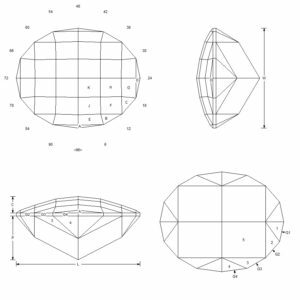 Rough evaluation and selection is another of those “dark arts” of faceting that nobody really talks about – and most people don’t have a systematic, scientific way of doing it. So, that’s one of the first things I developed for the Academy – a SYSTEM. And, we spend something more than a full day worth of time focused on rough evaluation and the economics – how to know what you can spend on a rough and make-out OK. The trial-and-error system of learning that gets REALLY expensive. I’ve spent $400 and up on individual roughs that wound up WORTHLESS once I got them home. This is like going to Tucson and travel and meals and hotel and buying rough and then getting it home and months later stressing-out about dopping that $400 rough – and then finding the crack I missed – or starting to cut it and having it blow up because I *still* didn’t see that crack, even before dopping. So, I got REALLY systematic about it – out of necessity. And, we really spend time and teach that in a totally systematic way at the Academy – with LOTS of material from my collection, and the rough I give students to cut is rough they select from kilos and kilos of rough material that they study through over a period of days until the eye is trained to see and the checklist of what to look for is just a habit. What to look for and how to look. The rough dealers at Tucson say I select “like a surgeon” – and they’re right. So, we really go deep into that in the Academy. This page contains a significant amount of the fundamentals about specific use of lighting techniques, and use of liquids, etc. It just scratches the surface of this involved aspect. I hope you find it helpful if you haven’t been there before. A great explanation of how to cut a checkerboard. I will not fear them any longer and plan on trying this one ASAP. Thank you John. I’m really excited to know the explanation has got you fired-up to cut one. I was intimidated by checkerboards, too – before I started cutting them. I think my first was the FVS-233 by Fred Van Sant. Everything by that guy is awesome, BTW. Once you start doing them you’ll really get hooked easily. They look SO much more complicated than they are to actually do. And, they are especially useful for two things: Making the stone look lighter, and camouflaging inclusions. So, use them on darker material or you’ll wash-out your saturation. And, if it’s darker and a bit included – like a darker Tourmaline that isn’t really clean – you’ll really be happy with what they do for you.